The hardwood-style flooring in our Springs luxury apartment homes looks beautiful on its own, and it also provides a nice backdrop for soft, decorative area rugs. You can keep your floors looking like new with the following helpful cleaning and maintenance tips. Sweep floors regularly to remove dust, loose dirt and pet hair. If you use a mop it should be damp, not soaking wet. This makes cleaning easier and more efficient. Choose a commercial cleaner specifically designed for wood-like floors. Bruce and Bona are two of the more popular brands. For a simple DIY cleaner, add two tablespoons of baby shampoo to a gallon of water. Apply and wipe dry immediately. Products like wax or polish might sound great, but they actually create a buildup that's difficult to remove. The shine is already built-in, so no enhancements are needed. Vinegar is handy for a number of cleaning jobs, but the jury is out when it comes to laminate floors. Many experts feel the acid can wear away at the finish. If you feel the need to use vinegar, it should be done rarely and diluted with plenty of hot water. Avoid Murphy's Oil and pine-scented cleaners, which leave a dull, streaky residue, as well as abrasive cleaners like Bon Ami that will scratch the floor’s surface. Rubbing alcohol works on several types of stains, including ink, crayon, and shoe or nail polish. Use a pencil eraser to remove scuffs and heel marks. Remove sticky stains such as chewing gum, wax or grease by applying ice to freeze it, then gently use a plastic scraper. Place mats under high chairs and pet dishes to prevent spills. Furniture pads should be used under all table and chair legs. Put runners or area rugs in high-traffic areas such as the front entrance. Keep dog and cat claws trimmed. 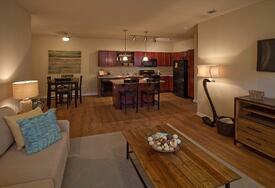 Hardwood-style floors are only one of the upscale features in our Springs Apartments homes. Stop in to our leasing office to learn more about other designer touches such as ceiling fans, granite countertops and faux-wood window blinds.